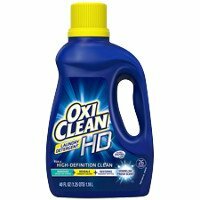 It's the OxiClean™ power you love, now in a liquid laundry detergent! Powered by three color-safe OxiClean™ stain-fighters, the thick, rich formula penetrates fabrics to deep clean every fiber of your clothes and help remove a wide range of tough, dried-on stains! The best laundry detergent i have found yet it goes great witb the suavital fabric softner. Good transaction! I was surprised with this coupon I love it! Very nice deal this soap is the best. I recommend this to everyone.